A member who can convince the military that they are a conscientious objector may request a discharge. This is not as easy as it sounds. First, you would have to show that your beliefs changed significantly after you joined the military because you must certify that you are not a conscientious objector at the time of voluntary enlistment. You can't pick and choose which war you object to. By law, a conscientious objector is one who is opposed to participation in all wars. The person's opposition must be based on religious belief and training, and it must be deeply held. The applicant must show that these moral and ethical convictions, once acquired, have directed their life in the way traditional religious convictions of equal strength, depth, and duration have directed the lives of others. In other words, the belief upon which conscientious objection is based must be the primary controlling force in the applicant's life. The burden of establishing a claim of conscientious objection as grounds for separation is on the applicant. To this end, applicants must establish, by clear and convincing evidence, that the nature or basis of the claim comes within the definition of criteria prescribed by DoD Directive 1300.6, Conscientious Objectors, for conscientious objection and that their beliefs are sincere. When evaluating applications for this status, commanders consider relevant factors including: training in the home and church; general demeanor and pattern of conduct; participation in religious activities; whether ethical or moral convictions were gained through training, study, contemplation, or other activity comparable in rigor and dedication to the processes by which traditional religious convictions are formulated; credibility of the applicant; and credibility of persons supporting the claim. 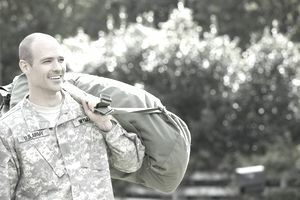 Department of Defense Directives allow a military member to be discharged early to pursue their education if they are within 90 days of their normal separation date. Sometimes a service will approve an educational discharge request of more than 90 days. For example, Air Force personnel can request separation after two years of service, if they have been accepted at an accredited school for medical training as physicians, dentists, osteopaths, veterinarians, optometrists, or clinical psychologists. Not just any schooling will suffice. The Navy Personnel Manual allows sailors to request a discharge for education in excess of 90 days, but the approval authority for a 90 day (or less) discharge is the commanding officer (special court-martial authority), and for discharges for more than 90 days before the normal separation date, it goes all the way up to the commander of the Navy Personnel Command. Neither the Army regulation (AR 635-200) nor the Marine Corps Regulation (MCO P1900-16F) allow for educational separations of more than 90 days prior to normal separation date. In order to qualify for separation under this provision, the hardship must not be of a temporary nature; must have developed or become increasingly worse since entry on active duty; discharge or release from active duty is the only readily available means of alleviation; and the individual must have made reasonable effort to relieve the conditions through other means available and appropriate to the family circumstances. An example of a hardship discharge would be the death or permanent disability to the soldier's immediate family such as the spouse who is primary guardian to the children of the family when the soldier would be deployed. If you don't qualify for a hardship discharge, however, you might qualify for a humanitarian assignment. This is kind of a catch-all for voluntary separations that don't fall under specific programs. Note that it's called "convenience of the government," not "convenience of the servicemember." One example would be discharge in order to enter a commissioning program. The military can also use this provision when it would really rather that you get out but doesn't have a basis to require your separation under any other separation program. Another example would be if you won the state lottery and became a multi-millionaire overnight. The services probably would not find it conducive to morale and discipline to have a 3-striper millionaire arriving at work every day in his private helicopter. In such cases, they would most likely gladly approve a discharge request under "convenience of the government." A service commitment is a period of obligated military service. For example, if you become an Air Force pilot, you have to agree to a service commitment of 12 years, following pilot training. Air Force pilot training is very expensive, and the Air Force wants to make sure they get their investment back. It may surprise you to learn that everyone who joins the military for the first time incurs a minimum eight-year service commitment. It doesn't matter if you signed a two-year active duty contract, a four-year contract, or even a six-year contract. Your total military commitment is eight years. Whatever amount of time that is not spent on active duty, must either be served in the active Guard/Reserves, or in the Inactive Reserves.